We recently spent a week in Elounda on the Eastern side of Crete, a place we had visited the previous year on our Cretan Road Trip. Whilst we were there we obviously had to check out a couple of the "cocktail bars". 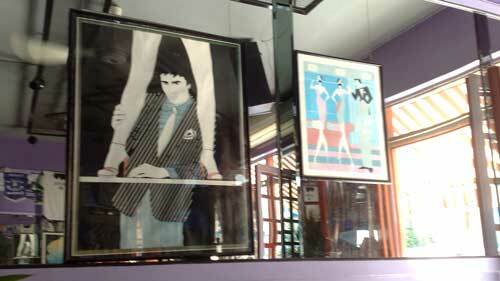 The first was the Malibu Bar, which was on the main drag as you approached town. 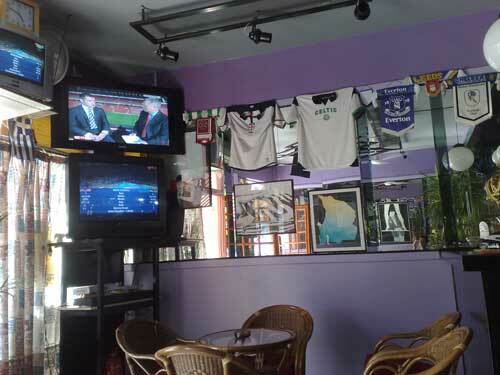 Although not to be confused with the Malibu Club in Grand Theft Auto: Vice City it nevertheless had quite an 80s theme to it, mixed with football memorabilia, as it had three screens showing sports all the time. 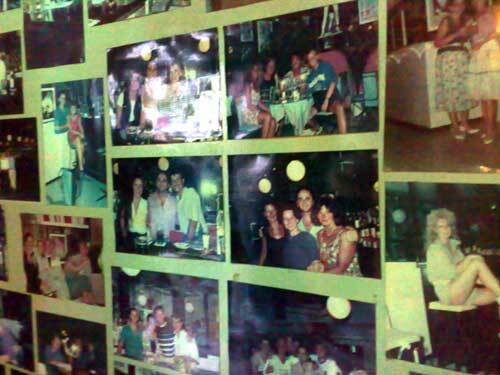 The wall of photographs showed the progressive thinning of the owners hair and a myriad changing fashions. I spoke to him, and he had in fact had the bar for nearly 25 years, and joked about his hair. He was a friendly enough chap, but since I was only really there for the football we didn't get to sample any cocktail creations. Nor did we get to see the DJ in action - there were stacks and stacks of vinyl LPs at one end of the bar, which put me in mind of the Rock Bar in Chania. 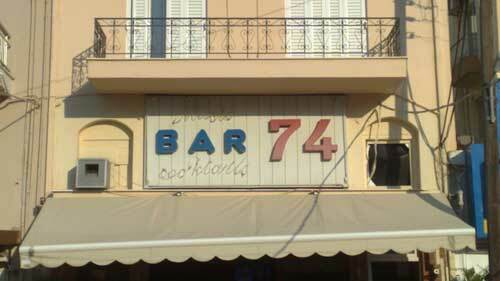 We also tried a place called Bar 74 on the town's main square. 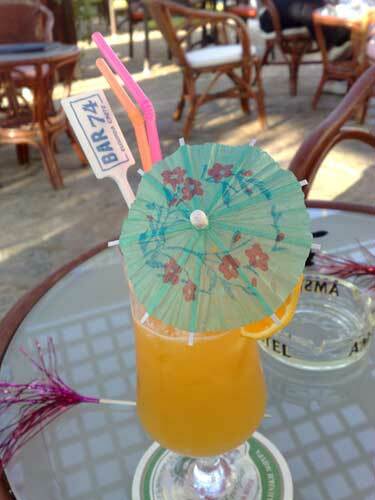 We had a sundowner of a 'zombie' and a 'tequila sunrise', which were very satisfactory. The view looked out onto the main square, where lots of young Greek boys were very busy making a noisy nuisance of themselves on their bikes! Our third cocktail stop was Katafygio, on the sea-front itself, curiously decorated with shop mannequins. We had a whole selection of cocktails, but the Mojito didn't come up to scratch. We got distracted from the drinks though by a Kingfisher, which seemed to be nesting underneath the boardwalk. 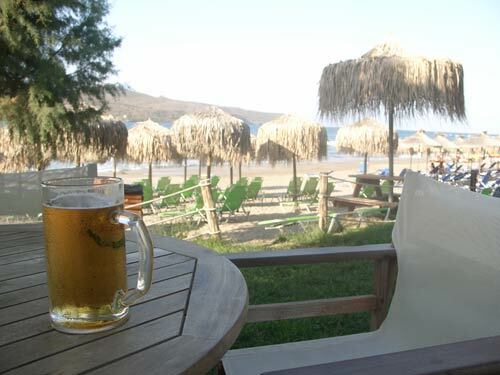 Although this is our third summer here in Crete, we are still making new discoveries all the time - the latest being the Balou Beach Bar in Agia Marina. 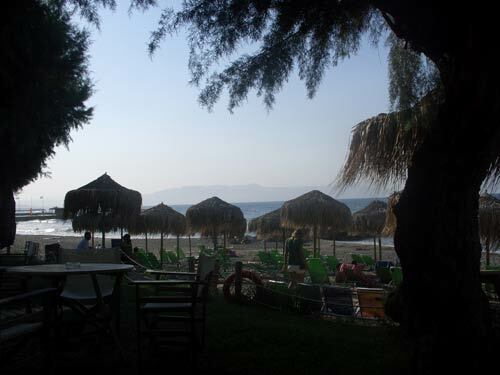 A couple of weekends back we headed out to the Agia Marina / Platanias tourist strip to try and see as much of the opening 2010 World Cup Qualifiers as possible. I was hoping that the early matches featuring Scotland and Wales would be on somewhere, but we trotted around for a bit with no joy. In the end we said well, why not just have a pleasant drink by the beach, and come back later to try and find the footie. 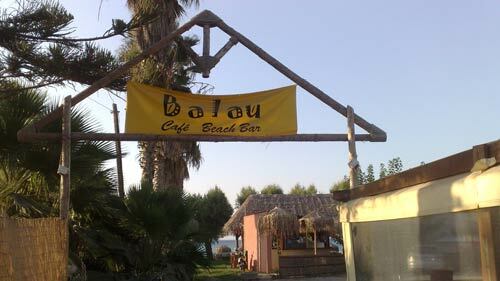 I don't think I've ever even noticed the sign for Balou before, but we took a peek down the alleyway towards the beach, and liked what we saw. 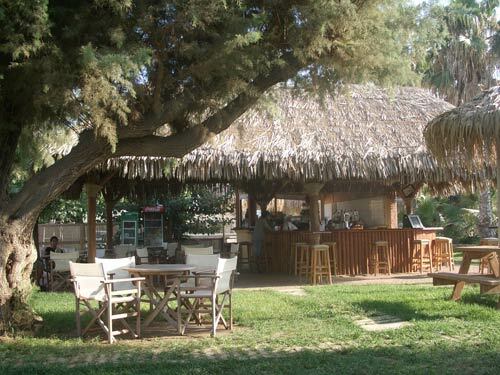 The bar itself is a thatched hut, set on a bit of grass right by the beach. There are trees dotted about, and the majority of the tables and chairs are in the natural shade of trees. That means that even in the blazing heat it seems a really cool place to sit, and you have a great view of Kri-Kri Island and the sea. The music when we have been there has been very mellow - either female vocal jazz, or the popular live album by Kurt Nilsen, Espen Lind, Askil Holm and Alejandro Fuentes which we've heard in a lot of places this summer. 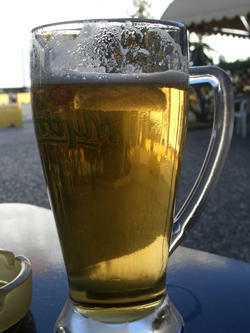 Oh, and there is, of course, ice cold beer. 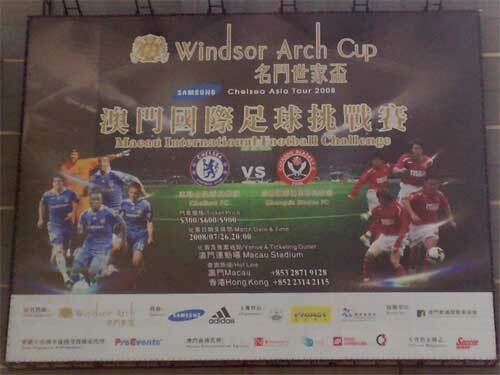 Whilst I was staying in Macau, Premiership Corporation Club Chelsea came calling as part of their money-spinning football promoting Asian Tour. They "played" Chinese side Chengdu Blades in the Macau Olympic Stadium, in a rather one-sided affair that ended up 7-0. In advance the promoters had announced that the game was sold out, but in the event the 15,000 seater stadium was barely half-full. I did think about going along, but eventually came to the conclusion that since I wouldn't be inclined to spend £20 watching a Chelsea pre-season friendly match in London, why should I suddenly go to one just because it was over here at the same time I was? The downside was that town seemed to be much more full of loud-mouthed British ex-pats who supported Chelsea than usual. 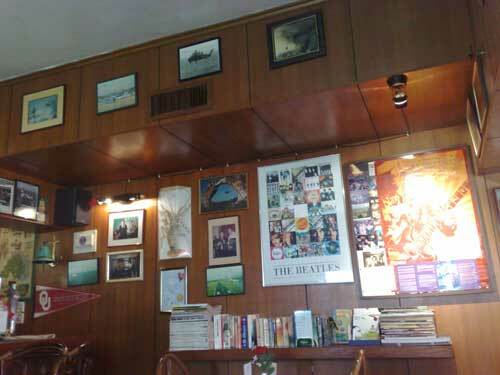 We encountered one particular example when we were having a meal at "Norman's Pub" in Hac Sa. He spent the entire afternoon boasting at great volume about his days as a Chelsea football hooligan in the 1980s, and how, in once having an Empire, "nobody could do what the effing British have done, nobody, not even effing Hitler". Nice chap, nice club. 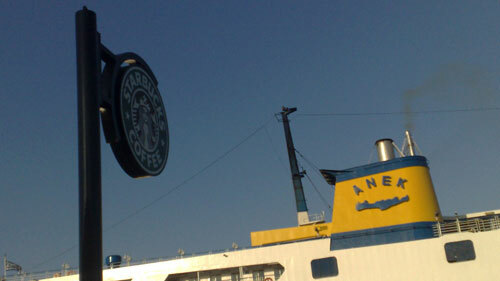 Greek culture is keen on recreating legendary voyages. We have our own replica Minoan ship in Chania, and a few weeks back a multi-national EU crew rowed a replica of Jason's Argonaut carrying boat to Italy. We tried a bit of a recreation of our own, and decided to get the ferry from Piraeus to Chania at the end of our Athens trip. Just over two years ago we made the same voyage. That time we weren't sure what to expect on the ferry, had never visited Crete, and had no idea whether we would be able to find a house or make a home there. 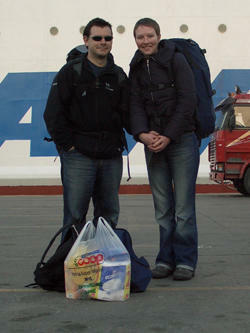 But what we did have was a couple of backpacks full of stuff, and a lovely, lovely ice cold beer by the side of the ship before we set sail. This time around, we were much better prepared for what to expect from ANEK lines. We got the complimentary bus that takes you from just about the door of the Metro to the ANEK ticket office - even though it is only ten minutes walk. 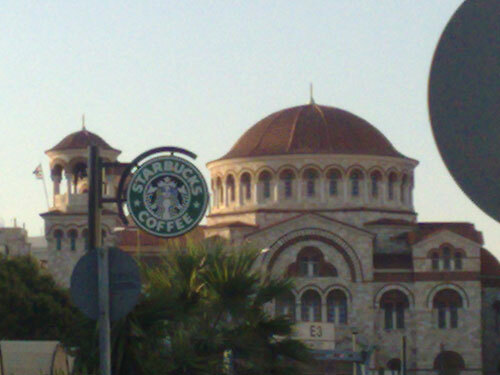 Then we headed off to get our ice cold beer...only to find that the quayside bar has been converted into a Starbucks! Are you tiki? Will you be tiki tonight? 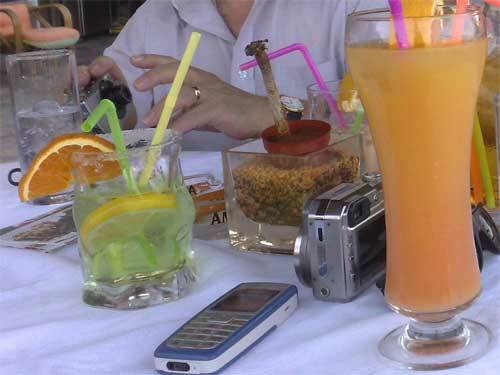 Whether we are checking out the bars in Hania's harbour, or supping on our own homegrown cocktail-o-clock recipes, as Brits abroad, we are never far away from a drink. This is a list of the posts we wrote about Drinking before September 2007. 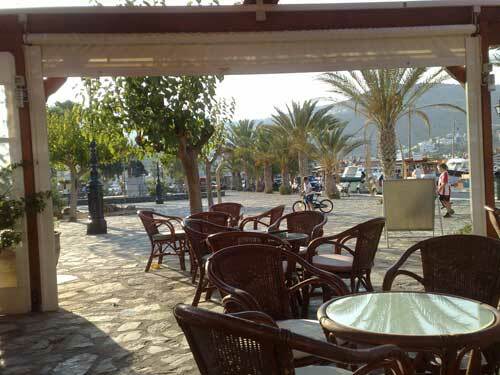 The bars of Hania - probably part 1 of a long series!